MacProVideo.com has announced the release of new tutorials to help users get the most out of MainStage, a component of Apple's Logic Studio software package. The company is also offering a new training disc for Digidesign Pro Tools 8. Prices range from $29.50 to $49.50. MainStage was developed for live performers. It helps musicians perform with software-based instruments and effects—for hardware control of MIDI and USB-equipped keyboards, drum pads, pedal boards and control surfaces, guitar rigs, keyboard racks, and more. MainStage 101 covers core MainStage usage. The trainer is Bill Burgess, who worked on the development of MainStage at Apple. It's priced at $39.50 and includes 240 minutes of video tutorial. 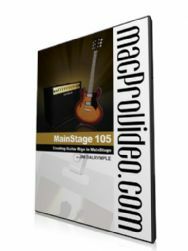 MainStage 105, priced at $29.50, features Macworld's own editor-at-large, Jim Dalrymple, who in his spare time is a talented guitarist who's working on his own album. Subtitled "Creating Guitar Rigs," Jim offers up MainStage guitar players information on how to get the most out of MainStage. His tutorial includes 150 minutes of material. Pro Tools 8 101: Core Pro Tools 8 is a $49.50 tutorial disc featuring Scott Frieman, a musician and entrepreneur who is the owner of Second Act Studio and a sound editor and re-recording mixer (among other items on a lengthy resume). This video, still in production, gives an overview of what Digidesign's pro audio engineering software offers in its latest major release.